It’s just one of those things. Despite my predilections for spouting my opinion like fact (instead of just what I believe), I can’t tell you why this is true. If you have a party – everyone ends up in the kitchen. This is an area of the house where there is family activity, it is a space that has specific purpose – sorta like the bathroom but if you’re having a party and everyone ends up in the bathroom, I’d say it was either a bad party or 1974. The kitchen is also the most expensive room in the house. Once you add up all the expenses associated with cabinetry, counter tops, appliances, and lighting (task, accent, and under-counter) , it’s easy to see why this room is special. It’s also the one room where we almost always have to rein in the client on what they want to do and how much of their budget they want to dedicate to the kitchen as a percentage of the whole. I get a lot of magazines and at best and on a good day I skim through them when on the phone with engineers. One of the magazines that graces my desk recently ran an article that caught my eye. It was ‘Professional Builder’ and the article was titled “Survey: Majority of builders believe that kitchen is key to selling new homes’. While I don’t generally believe that the road to happiness is necessarily through following the thought process of the majority, I really thought this was an article worth sharing with my readers. I went ahead and pulled out and modified some of the graphics from that article so you could get the main idea without having to slog your way through a trade periodical. 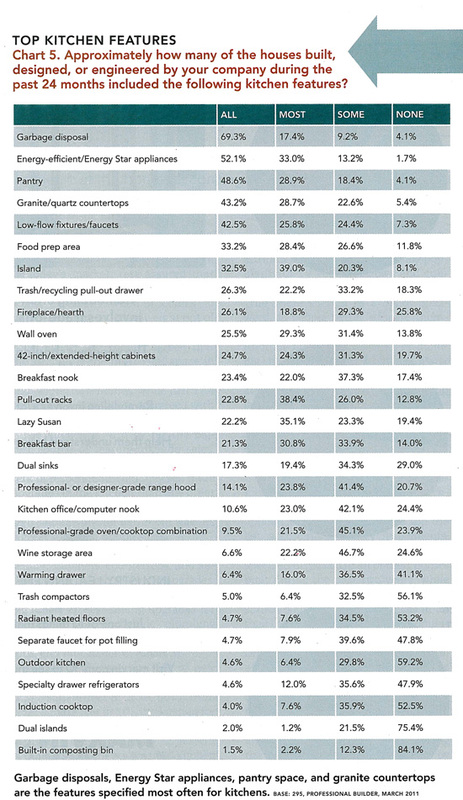 Did you ever wonder which features in your kitchen had the most value or importance? 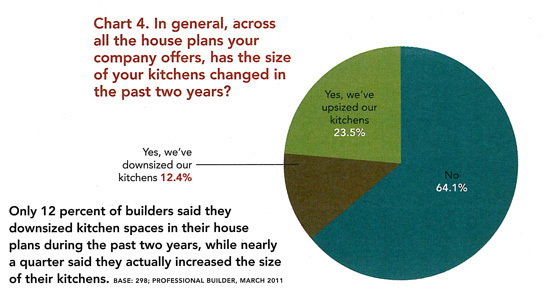 If you were looking for some sort of justification that the ideas you had about expanding or improving your kitchen were good ones – you can check the chart below and see what the people who were surveyed thought. 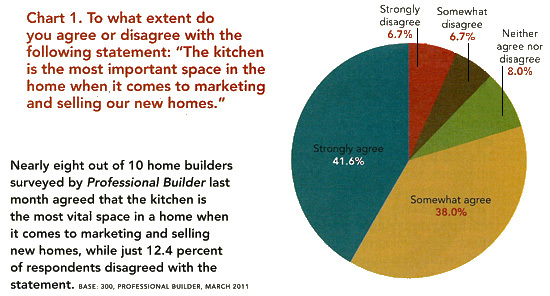 Kudos to Professional Builder for putting together such an interesting survey and packaging it up so well. Even though I don’t design speculative housing, I spend a lot of time talking about kitchens, their value and role in the home and within the budget. Now I feel like I have some data to back up what I already believe for the most part. Home is where the heart is – but it’s the kitchen that is the heart of the home.